Category: Solid Braids. Tag: Solid Braid Nylon. 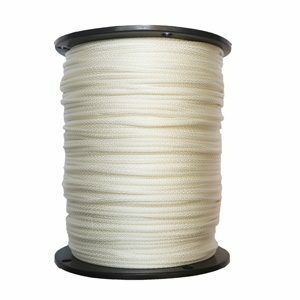 Solid braid nylon is a strong, soft, lightweight cord with excellent resistance to rot, abrasion, mildew, petroleum products and most chemicals. It has shock-absorbing elasticity which allows it to withstand great strain and its braided construction stays round and works well with pulleys. Tensile strengths – Are approximate average for new, unused ropes. To estimate the minimum tensile strength of a new rope, reduce the approximate average by 15% (Cordage Institute defines minimum tensile strength as two standard deviations below the average tensile strength of the rope).